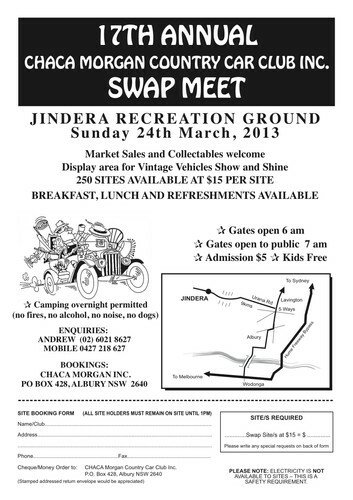 Swap meet, vintage vehicle show and shine, clubs & enthusiasts car display. Swap meet: market sales and collectables welcome. 250 sites available at $15 per site. Camping overnight permitted. No fires, no alcohol, no noise, no dogs. All site holders must remain onsite until 1.00pm. Bookings Chaca Morgan Inc. PO Box 428, Albury NSW 2640, or contact Andrew on 0427 218 627. Gates Open to Sellers: 6am. Gates Open to Public: 7am. Vintage vehicles show & shine: entrants (driver free) passengers $5 each. Trophies: Best Motorcycle, Best Holden, Best Ford, Best Chrysler, Best American, Best European. Car/vehicles display: clubs & enthusiasts all welcome. Cars, trucks, utes, Hot Rods, racing cars, motor bikes, buses, vintage, classic, modern. designated areas, Holden, Ford, Chrysler etc. Breakfast, lunch & refreshments available.